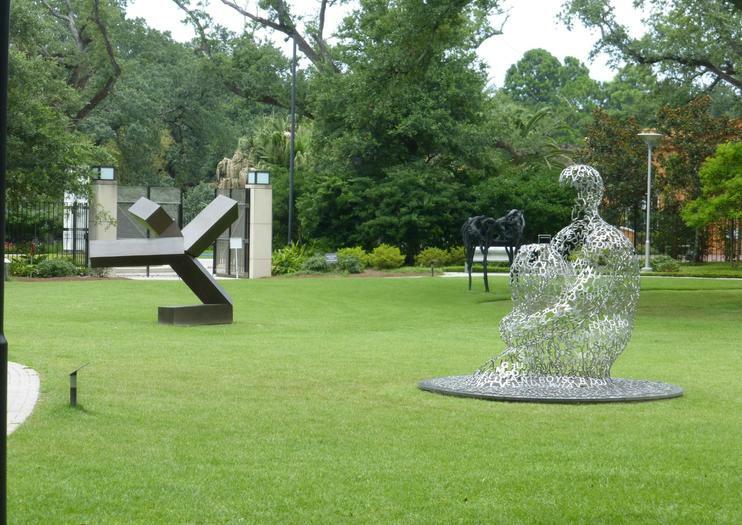 Part of the New Orleans Museum of Art (NOMA), the Sydney and Walda Besthoff Sculpture Garden is home to more than 60 sculptures from renowned artists. The sculptures are set among magnolia trees and live oaks draped with Spanish moss, and visitors come to enjoy the art and the beauty of the surroundings. Set in the southern end of New Orleans’ City Park, the Besthoff Sculpture Garden was established in 2003 to house the collection of local art patrons Sydney and Walda Besthoff. Adjacent to the New Orleans Museum of Art, the 5-acre (2-hectare) garden is dotted with memorable sculptures, such as River Form by British artist Barbara Hepworth and Corridor Pin by Coosje van Bruggen and Claes Oldenburg. The artworks are positioned alongside paths that wind under trees and past water features, creating a peaceful atmosphere. Visitors often combine a visit to the garden with the next-door museum or with other top New Orleans landmarks on guided bus tour of the city. Download the information app on your phone before you arrive for a guide to the garden with audio tour. Entry is free to the Besthoff Sculpture Garden. There is a cafe in the museum. The garden is wheelchair accessible. The Besthoff Sculpture Garden is located at 1 Collins Diboll Circle in City Park, New Orleans. The Canal–City Park Streetcar line runs from the Central Business District to City Park, and guided tours of the city also stop at the garden. The 27 and 60 buses run nearby. There is free parking available on the streets surrounding the park. The garden is open seven days a week. Summer hours (from April 1 to September 30) are 10am–6pm, and winter hours (October 1 to March 31) are 10am–5pm. The garden is closed on Endymion Saturday, Lundi Gras, Mardi Gras, Thanksgiving Day, and Christmas Day. Once you’ve explored the sculpture garden and NOMA, plan to spend an hour or two in City Park itself. There are a number of fun activities for adults and children, including boating on Big Lake, the Carousel Gardens Amusement Park, mini-golf, and the Train Garden, where tiny replica trains and streetcars zip around miniature versions of New Orleans landmarks. Relax and absorb the rich history of New Orleans from your window seat aboard our air-conditioned buses. This 2.5-hour, small-group tour will pick you up at your hotel and visit many of the most historic neighborhoods including Treme, The French Quarter, The Warehouse and Garden Districts, Faubourg St John and Marigny. Stop in one of the world-famous St Louis cemeteries for a sobering and spooky sidebar and escape the group for some solo adventuring before you return to the bus.